Griffin is an Creature/Monster in The Witcher 3: Wild Hunt. "Aye, half-eagle, half-tomcat, just like on the lord's crest. 'Cept this 'un was carryin' me dead cow 'stead of a scepter. Griffins were once only found high in the mountains, where they would hunt marmots and wild goats. When humans encroached on their lands, however, griffins soon discovered a new source of much more plentiful and easier-caught prey: cows, sheep and shepherds. Though still wary of main roads and towns (where folk with the means to higher a witcher are like to dwell), these half-eagle, half-wildcat creatures have gone from rarities to oft-encountered pests known throughout the Northern Realms. 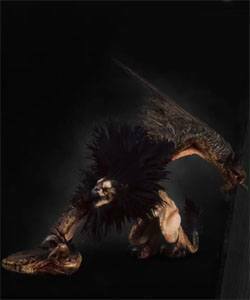 Especially hated are the subspecies known as royal griffins and archgriffins. "